Yesterday evening, I got the opportunity to travel up north with my friends Bryan and Katie to try a Cuban place that both of them had been to before. Having never tried Cuban food before, I was very curious to expand my horizons and sample something different. It’s a nice 40 or so miles north of us (which makes for roughly an hour drive), but it’s a relatively straight shot right up the Garden State Parkway. From some of the reviews that I read prior to heading up, it sounded like when the place was packed, it was as packed as a can of sardines and wait times could go through the roof. Being a Sunday evening, the crowd might have been considerably lighter, as we were able to be seated immediately. Bryan mentioned that those reviews might have noted the crowds during Friday or Saturday nights, so it’s probably advised to maybe hit the place up on another night to avoid the crowds altogether. The first thing that struck me when we entered was the atmosphere and décor. From the streetside, it looks very unassuming; however, the second you step inside, you practically feel like you’re in the Caribbean, from the music playing to the plants to the attire of the staff. (One could almost even venture to say that the occasional sweltering heat also adds to the Caribbean feel.) There is a mix of indoor and outdoor seating laid out in a U-shaped form: the indoor seating lined the area that made up the “U,” and the outdoor seating was located in the courtyard in the middle. Even while seated indoors, however, the doors were open to allow for some nice fresh air to roll in. We opted in for a pitcher of their “sangria” to refresh ourselves. I use the term in quotations just because the restaurant doesn’t technically possess a liquor license, so they make the sangria with 0.5% alcohol content. I would classify it more kind of like a fruit punch rather than a wine punch in the traditional sense, but it was still refreshing nonetheless. For tapas, I got the goat cheese fritters (which was fried goat cheese served with some honey), Bryan went for crispy chicken lollipops with a cilantro mojo, and Katie got some fried cheese as well. I found the fried goat cheese to have quite an interesting flavor profile. The goat cheese inherently has a slight bitter flavor, but the honey gave it that sweetness to contrast it. Added to the fact that the goat cheese has more of a cream cheese consistency, and it was almost like it melted in your mouth. For the main course, I opted in for a Pollo Cubano, which was a grilled chicken breast basted with a garlic mojo (a sauce consisting of olive oil, garlic, paprika, and cumin). 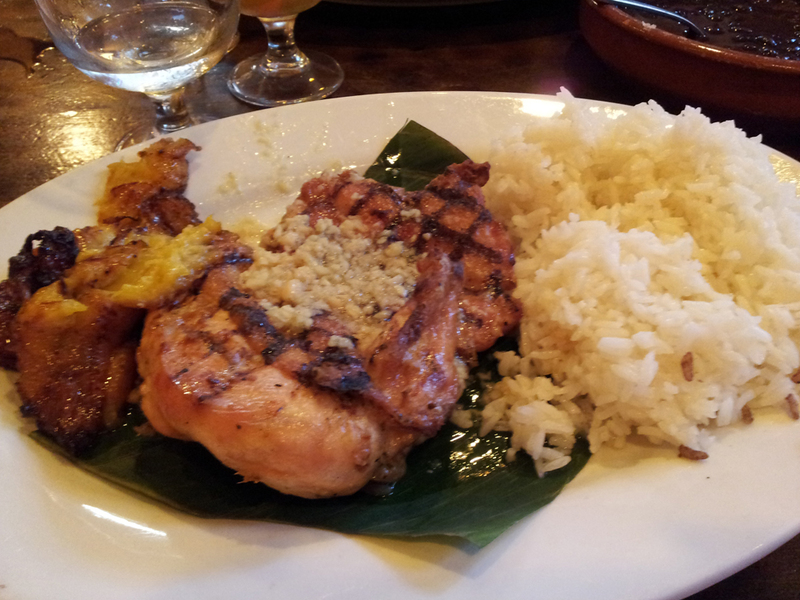 It was also served on the side with some white rice cooked in chicken broth, black beans, and fried plantains. The chicken paired with the garlic mojo gave it a lot of great flavor; however, the chicken ended up a little on the dry side (might have been a byproduct of being on the grill for too long). The rice was quite the sleeper hit with me, since I wasn’t expecting a whole lot out of some innocent looking white rice. Paired that off with some black beans and it was quite delicious. 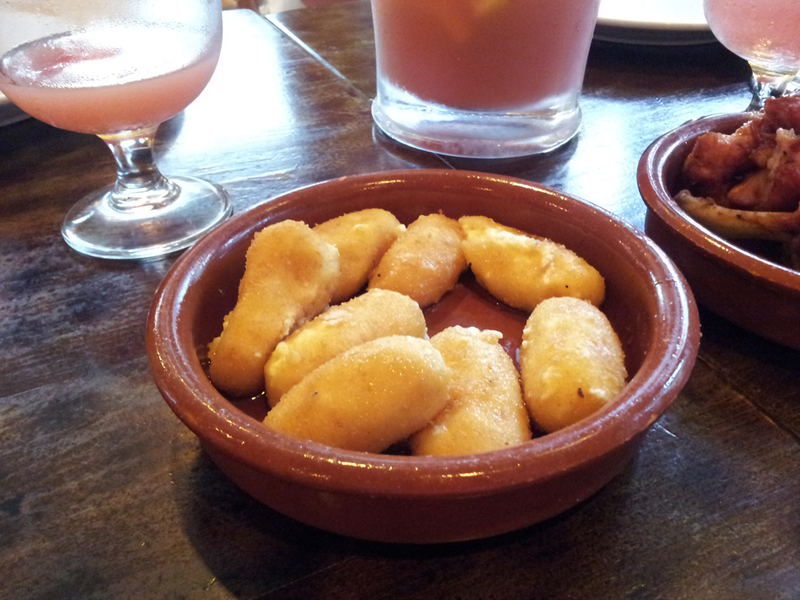 The fried plantains ended things on a sweet note, like a mini-dessert! 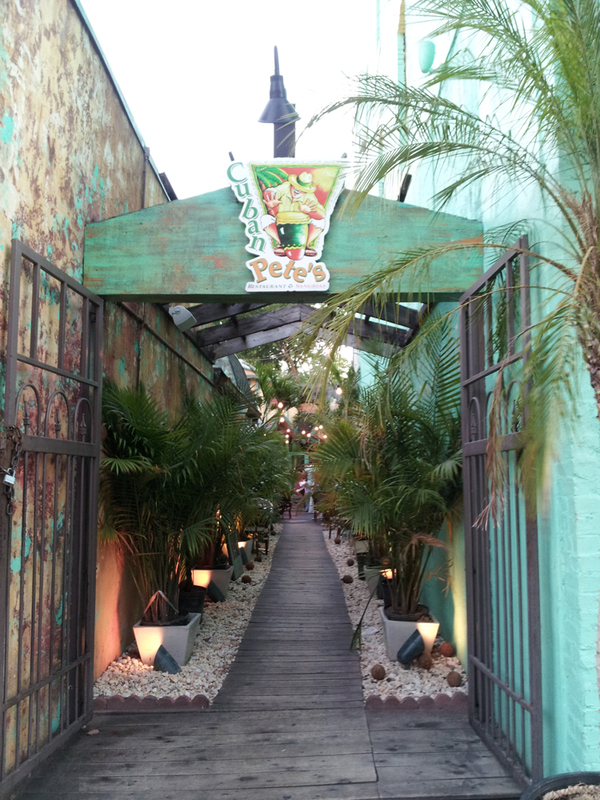 Cuban Pete’s was a nice place to get some delicious food in a very relaxed atmosphere. We managed to avoid the crushing crowds from the reviews that I was reading, and I’m sure that also made the experience more pleasant. Having not tried Cuban food before the visit, I was happy to see that the cuisine takes common ingredients and kicks it up a notch with a great blend of spices and herbs. I would definitely visit again to sample some of their other dishes. Some flavorful dishes and wide selection to choose from makes for a very satisfying meal. The décor certainly adds a lot to the overall feel of the restaurant. During our visit, it was a really nice balance between a bustling dinner crowd and a casual ambiance. I could, however, also see how having a fully packed restaurant could make it harder to enjoy your eating experience. Our server was pretty nice and he was good about getting us refills for water. Sometimes he was really quiet though and I wasn’t sure if he heard my order correctly. For the price and the portions, I think that things might have leaned slightly on the expensive side. 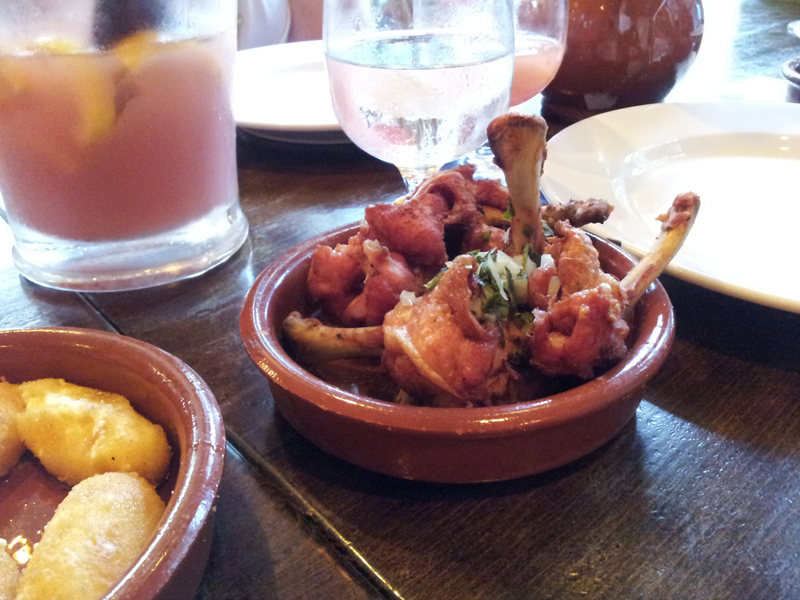 However, the food tasted great and I left feeling very satisfied. Heard from multiple sources that it’s a great spot. But for great food and shocking prices that can’t be beat, I highly recommend Rumba Cubana, Zagat rated!, 7420 Broadway, North Bergen,NJ. Thanks for the suggestion, Diaevfl. I will have to check that place out sometime.